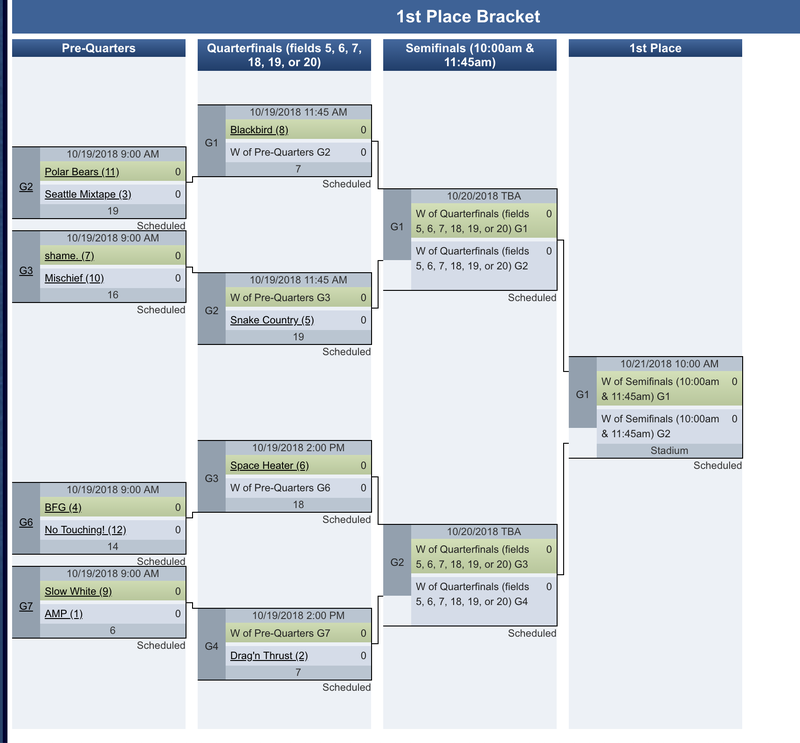 With one wild day of pool play in the books, the bracket in the Mixed Division is set. Potential contenders have landed in new spots and the race for Player Of The Year is heating up. Thursday pool play brought chaos to the mixed division, with only one of the top four seeds winning their pool (#2 Minneapolis Drag’n Thrust in Pool B). Out of the twelve teams left, here are the top six teams ranked by their chances to make the final. The stage is set in the 2018 Mixed Club Championship bracket. The bottom half of the bracket presents a more difficult path than the top half, with No. 1Philadelphia AMP, No. 2 Minneapolis Drag’n Thrust, No. 4 Seattle BFG, and No. 6 Washington DC Space Heater all fighting for one spot in the final. In the top half, No. 3 Seattle Mixtape and No. 8 San Francisco Blackbird look the most likely to take the other spot in the final given the comparably weaker potential semifinal matchups. Despite taking a late loss to rivals Space Heater and consequently finishing 3rd in their pool, the defending champs look the most likely team to make the final even though they face a dangerous No.11 San Francisco Polar Bears in prequarters. This ranking is mostly driven by their potential path. While the two Southwest teams ahead of them produced good results yesterday, Mixtape should be favored in both of those matchups. Get through Polar Bears and Blackbird, and a game against No. 7 shame., No. 10 Mischief, or No. 5 Snake Country awaits in the semifinals, which all present winnable matchups. Although Mixtape lost to Space Heater they should feel confident in their chances of making the final given their path, proven star power, and championship pedigree. Winning their pool even with a loss to No. 13 Durham Toro puts Blackbird in near prime position to make an unexpected run to the final. Like Mixtape, their path sets up well with a weaker other quarter, but unlike Mixtape, they avoid a prequarters matchup. So why are they ranked second behind Mixtape? Their overall season record Regionals performance, which makes them a likely underdog in a potential quarters game against Mixtape. Blackbird could see their San Francisco rivals Polar Bears with an upset in prequarters and would feel upbeat about that matchup as well as those in semifinals, as their strong squad led by Mac Taylor can take down the best teams in the division, as Philadelphia AMP knows too well. Speaking of AMP, the Philadelphia team will feel frustrated that they let their match against Blackbird slip away, but the overall No. 1 seed still have the best final odds out of a stacked bottom half. AMP played well in their first two games and although they lost to Blackbird, they showed the talent and effort that brought them top billing. That will serve them well against No. 9 Boston Slow White, who looked good against BFG but faltered against fellow Bostonians Snake Country. If Blackbird get past Slow White, a game against Drag’n Thrust awaits them, a match many thought would be the championship decider. Beat Drag’n Thrust and the path opens up a bit, but is still not an easy one, with BFG or Space Heater in the semifinal. Out of a packed bottom half, AMP look like the best bet to make the final but given the competition it’s not close to a given that they’ll get there. Similar things can be said of Drag’n Thrust as of AMP, but the Minneapolis squad did manage to pull out their final game, a close 13-12 win over shame. This gives them a bye into quarters, avoiding a potentially dangerous prequarters matchup, but their likely opponent is no cakewalk in AMP or Slow White. The winner of that quarterfinal matchup seems like the favorite from there, and Drag’n already owns wins over BFG and No Touching! this season. However, the Seattle squad and DC’s Space Heater can both challenge Drag’n Thrust, so their path is by no means assured. With their bye Drag’n Thrust seem well set-up for a run to the final but a tough potential quarterfinal against AMP could end their season prematurely. Space Heater’s convincing 15-9 win over Mixtape landed them in difficult bracket position. Space Heater did take a loss to Mischief but otherwise looked good yesterday, so their low ranking here is mostly a product of the teams possibly waiting for them in the semifinal: AMP and Drag’n Thrust. Given their result against Mixtape, Space Heater should feel comfortable with a probable quarterfinal matchup against BFG but their road might end after that in the semifinal. Space Heater certainly can beat AMP, having done so already at the AMP Invite, and Drag’n Thrust, but they will not be favored if those semifinal opponents materialize. If upsets continue to wreck havoc on the mixed division, though, Space Heater could be well positioned to take advantage and make the final in their first season. As with Space Heater, their ranking is less to do with their play as much as it is with the path in front of them, with an added step of a prequarters game against No Touching! before they can consider Space Heater, AMP, and Drag’n Thrust as potential opponents. BFG did not play their best yesterday, but with wins over a full third of remaining teams, including Drag’n Thrust, Slow White, and No Touching!, BFG will feel confident that they can challenge and even win any of their remaining games. BFG will be favored over No Touching! in prequarters, as the Minneapolis team only have a win over Toro to their credit this weekend. After prequarters, though, BFG will likely be underdogs in the remaining games, and face a possible, but uphill path to the final and a possible double peak. Who’s still got a shot in the Mixed Player of the Year race? Only a month and a half ago, the Ultiworld staff considered the list of players in the hunt for Mixed Player of the Year. After a day of play at Nationals, let’s review the list and see who’s still in the mix, who’s dropped out, and any new additions who might be worth throwing into the ring. Sam Valesano – Minneapolis No Touching! Mac Taylor must be considered the favorite at this stage. San Francisco Blackbird started slowly this morning with a loss to Durham Toro, but Blackbird was at its best when Taylor was involved early and often, on both sides of the disc. He is a jack of all trades for his team and he can do it all at an elite level. Taylor’s skillset is unparalleled: shutting down opposing cutters, initiating the offense from the stack, striking deep, and handling and breaking open defenses. You name it, Taylor does it. Through Day One, per USAU’s stats, he is leading the division with 10 assists and being the force that opposing teams always need to account for. He faces the toughest defenders and gets the best of them anyway. Bad news, folks: we have to take Jack McShane off the list. Nationals performance is a major component of the Player of the Year award, and if your team doesn’t get to Nationals, Player of the Year is off the table. McShane is an incredible talent, and his handling skill is what put him on the list in the first place. He had Love Tractor in contention with some of the top teams in the division, but Fort Collins shame. put a stop to their run in the final of South Central Regionals. Sam Valesano continues to put up impressive stats for No Touching!, leading the team with seven goals, notching five assists, and being the ultimate bailout for No Touching’s handlers. She has an incredible knack of coming down with any 50-50 discs in her vicinity, and her ability to keep the Minneapolis offense moving helped push them past Toro to seal a berth in the prequarters. However, the ceiling of No Touching! is still pretty low. They have a tough matchup against a motivated Seattle BFG team in the morning, a team that knows how to take away a team’s top option and force opponents out of their comfort zone. Her case for POTY rests on how far No Touching! can go, and it’s tough to see a deep run. Carolyn Normile and Khalif El-Salaam are both in interesting spots. As primarily defensive players, their stats won’t always line up with primarily offensive players. Their gravitas forces offenses to adjust where they attack and how they attack, disrupting throwing lanes and shutting down entire sections of the field. On offense, they’re aggressive throwers who can punish subpar O-line defenders with big hucks and speedy cuts. But team success plays into this as well, and neither team hit their lofty expectations. With AMP falling to Blackbird and missing out on a bye to quarters, and Mixtape suffering the same fate, the path to the final is much tougher moving forward. Looking forward, if Normile and El-Salaam can shut down some big offensive threats and push their teams into the semifinals, their cases get much stronger. Keep an eye on a potential El-Salaam – Mac Taylor matchup in the quarterfinals tomorrow, and if Normile can disrupt the Drag’n Thrust offense in their potential quarterfinal matchup, they’re back at the top of the list. Sarah Meckstroth of Drag’n Thrust has an odd case as well. She has been incredibly efficient as a player this weekend, but she has not been on the field as much as one would expect for such an important player. Drag’n Thrust might be trying to limit her minutes early in the tournament so they can lean on her later, and she is still leading the team in assists through the first day. However, Drag’n could have made shorter work of their matchups against San Francisco Polar Bears and New York XIST. Expect Meckstroth to play as many points as she can in what could be Drag’n Thrust’s only game on Friday. The picture will be much clearer tomorrow evening. Who else do we need to consider? Peter Prial of Boston Snake Country springs to mind. 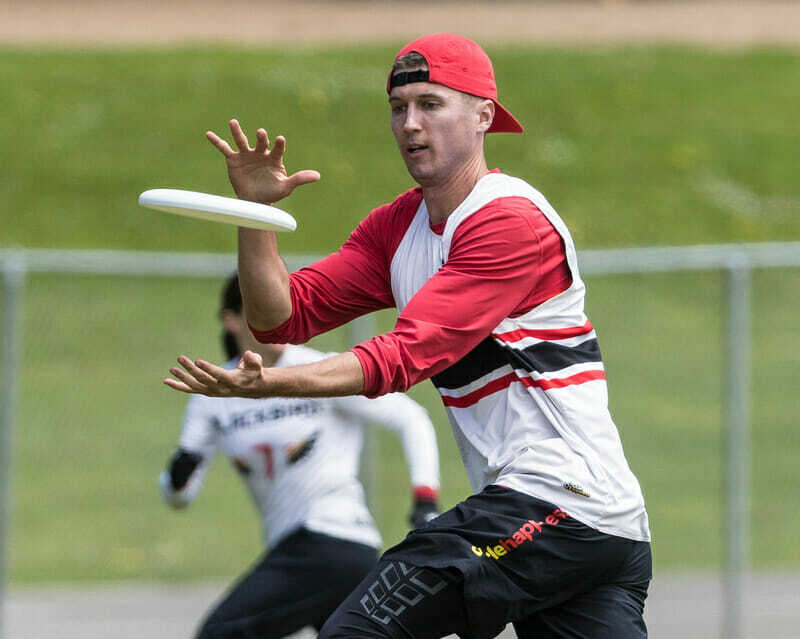 With three goals and five assists, he’s been at the center of Snake Country’s smoothest points so far at Nationals, and when the team needed a lift to get back into the game against Seattle BFG, it was Prial who picked up the slack. He’s still one of the game’s dominant cutters, and is a tall, fast defender when Snake Country needs to get a break. If Snake Country pushes into the semifinals, Prial will be a big reason why. Finally, Jenny Fey of Washington DC Space Heater deserves to be considered. She has taken her Washington DC Scandal central handler role and moved it to the mixed division with barely a hitch. The vision is still there, and if anything, she finds herself with even more options downfield. When Space Heater needed a big score, Fey was at the center of the offense. She’s seen it all before, and she is the force to make the Space Heater handler set click. When she was sidelined from the action, Space Heater ground to a halt. This team will go as far as Fey will drive them, and if she’s on, they’re a threat to get to the final. Will this look different tomorrow night? Definitely. But after Day One, these are the players to watch. Comments on "Mixed Day 1: Revisiting the Mixed POTY Shortlist"